I have a meaty contest today and I know that you guys are going to love it! I’ve teamed up with Omaha Steaks to offer one winner a prize pack filled with (4) 5oz bacon wrapped filet mignons. I mean – YES, PLEASE! I recently spent some time in Omaha, Nebraska with the team and learned all about their process and quality checks. I ate more steak than I thought humanly possible – and that is NOT a joke. But you know what? Nobody complained because we had so much fun. I got to meet a group of wonderful people, align myself with a great brand that I hope to continue to work with for years to come, and visited Nebraska for the very first time. An absolute pleasure! You see this smile? I know it looks painful to you… but, ok actually it was a little painful. 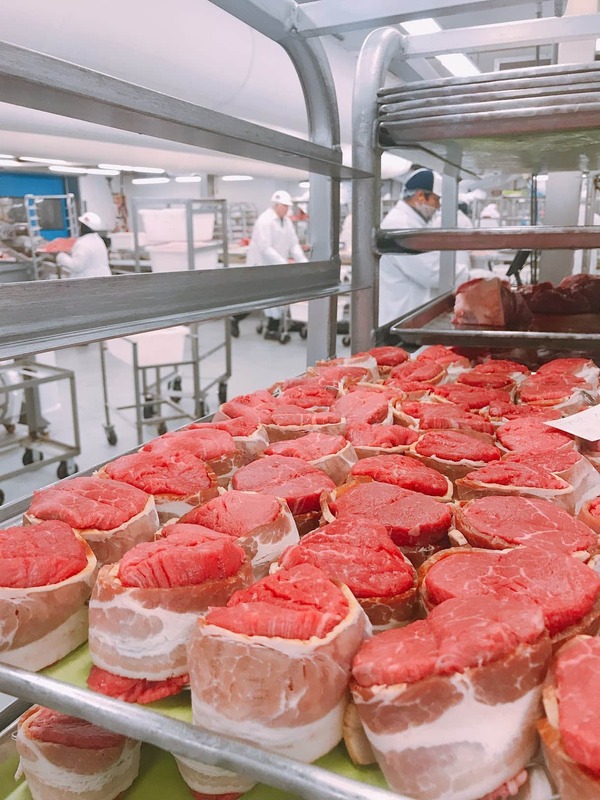 Omaha Steaks allowed us to walk into one of their ice cold freezers for a second and that’s all I could humanly handle. You had to hold your hat because the wind was so wild. There WAS SNOW ON THE GROUND. THE ROOM MADE SNOW! DO YOU UNDERSTAND ME? I was smiling on the inside – I promise. We did get a factory tour that made me have such a deep appreciation for WHERE my food came from. It’s not aisle 8 – if you know what I mean. 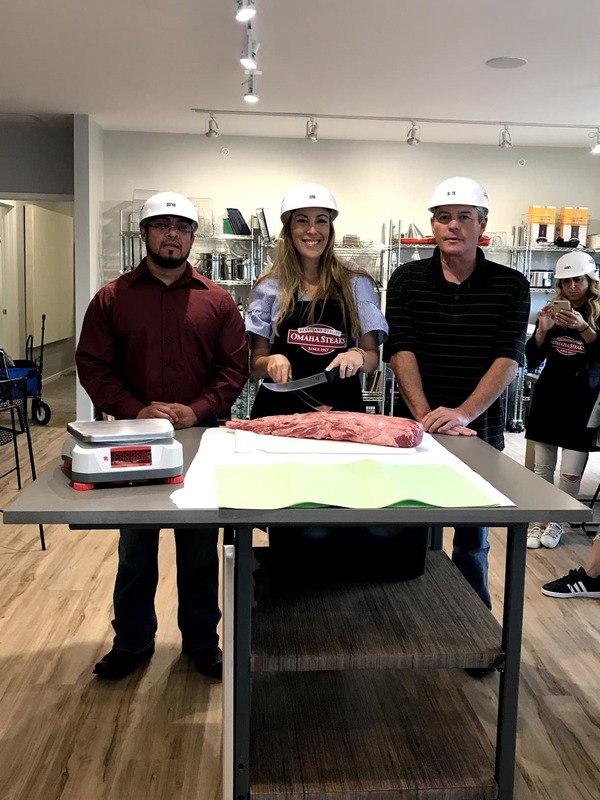 🙂 Not only did I learn how the meat was processed, but I also met some of the ranchers and farmers that partnered up with Omaha Steaks to bring all of us the yummy goodness. I broke bread with these people – in their HOMES. What an experience!!! There will be plenty more information coming up about our partnership, but for now – let’s get right to the giveaway. To enter, you must be a US Resident and at least 18 years old. This contest will run for one week. Good luck! * I’ve teamed up with Omaha Steaks to offer this giveaway to you. I would love to try Bacon Wrapped Filet Mignons! Sounds yummy! I would love to try the Main Lobster tail halves from Omaha Steaks. Bacon Wrapped Filet – my family would love me (for hours anyway). I have always wanted to try OMAHA STEAKS..!! Oh my GOODNESS, these sound AMAZING!!! Amazing epic top quality products. I would love to try the File Mignon! That is my favorite cut of meat. I would love to try the Potatoes au Gratin! My husband would love these so much. I’ve always wanted to try omaha. I would love to try the ribeye steaks, our favorite! I want to try their ribeye steaks they are my favorite cut. I would like to try the Private Reserve® Filet Mignons. I would like to try the Mahi Mahi. Omaha Steaks are just top notch! Always giving away goodies amd keeping us full bellies. Thank you for another giveaway! I love their steaks. I would like to try some of the seafood. The Private Reserve® Ribeye Crown Steak looks SO yummmmo!! The Bacon Wrapped Filet Mignons sound delicious! Bacon wrapped filet Mignons sound so delish! I’d love to try the Ribeye steaks. I would love to try the NY strip steak. I would love to try the Bacon-Wrapped Pepper Jack Shrimp. I would like to try a T-Bone. These are some of my favorite cuts of meat! I would love to order some lobster from Omaha steaks. I like the one in prime rib. My dogs love to have the left over bones from this. The Bone-In Frenched Prime Rib Roast would be incredible to try. The price will knock your socks off though! I love to try Porterhouse Steak! I would like to try the Italian Breaded Veal Patties. The Bacon Wrapped Filet Mignons look wonderful!! The Bone-In Frenched Prime Rib Roast would be a real treat to try. Fall Favorites Medley looks amazing and at a great value as well! I would love to try the Cold Water Lobster Tails. I`d like to try the Filet Mignon Burgers. I would also like to try the King Crab Legs. I’d love to try the bacon wrapped filet mignons please! 24 oz Dry-Aged Bone-In Ribeye is my choice to try. I would love some king crab legs to go with my steak. delicious. My family loves ribeyes, I would love to try Omaha Steaks ribeyes. I would likd to try the T-Bone Steaks. I cant believe I’m admitting this but I’ve never had a filet mignon before so that would be my first choice but the New York strip and their desseets sound awesome also. I’ve ordered from them for my Mom before bc she is in her 80’s but I just havent got myself anything as if now. She loved it and I didnt have to worry about her having food for awhile as she lives almost 4 hours away. The bacon wrapped Filet Mignons look good. I LOVE bacon and mignon is my favorite cut of meat. Sounds like perfection. Another thing I’d like to try their seagood. I have a fear of eating seafood from a lot of places but I’m sure they make sure theirs is good. For a holiday Gael Theron goes, I would love to try the Boneless Heart of Prime Rib Roast. I’d love to try your Ribeyes. I am a steak lover so I would love the filet. I would love some mahi mahi. I haven’t had it in years. Bacon wrapped filet mignons sound pretty tasty. We just bought an amazing new grill. Bring it on! The 24 oz Dry-Aged Bone-In Ribeye looks amazing! I would love to try Bacon Wrapped Filet Mignons or the rib eyes. I would love to try the Alder-Planked Salmon Fillets: Original. I would love to try the lobster tails! Just about anything they have is great, but that is one of the things I haven’t tried yet. Sure would love to try these. I would try top sirloins. They look good. I would order T-Bones to try on the grill. I would love to try the boneless pork chops. they look delicious. I would love to try the Alder-Planked Salmon Fillets. The Bacon-Wrapped Scallops look delightful. I would love to try these out on my family. I’d love to try your Ribeyes. Also the Porterhouse. I would love to try the bacon wrapped filet mignon. It sounds delicious! The bacon wrapped filet mignon, wouldbe great. I would love to try the Polynesian Pork Chops. Getting one of their Thanksgiving dinners would be spectacular. I’m curious about Omaha Steaks’ lasagna. I would die for a prime rib “steak”. Only get this once in a blue moon but love it! I would like to order the Gourmet Bratwurst. So much looks delicious. I would love to try the slow cooker BBQ mac and cheese.